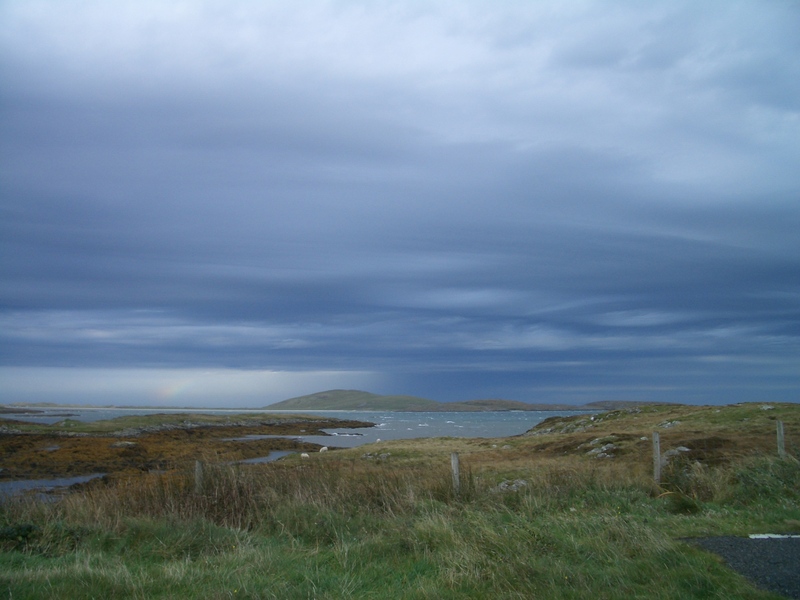 Having arrived on the island of Barra at 2am due to an 8 hour ferry delay, we really had no idea what to expect when we rose the next morning, by which time Hurricane Ophelia in full force. 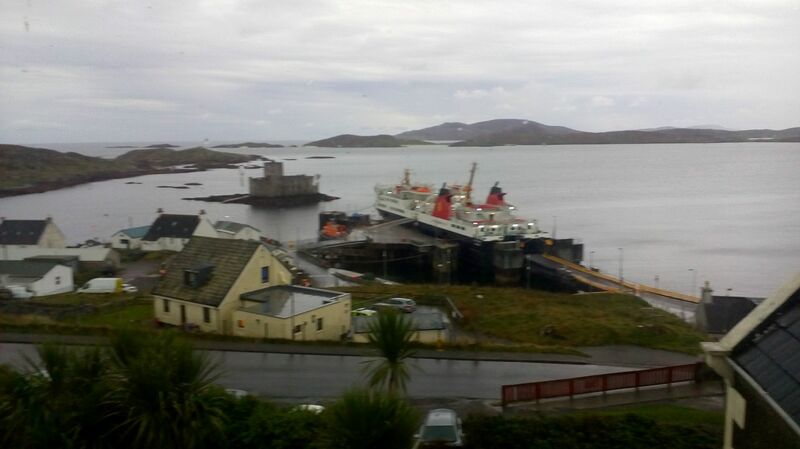 You don’t get the full effect of the wind and rain, but believe me, that ferry wasn’t going anywhere! 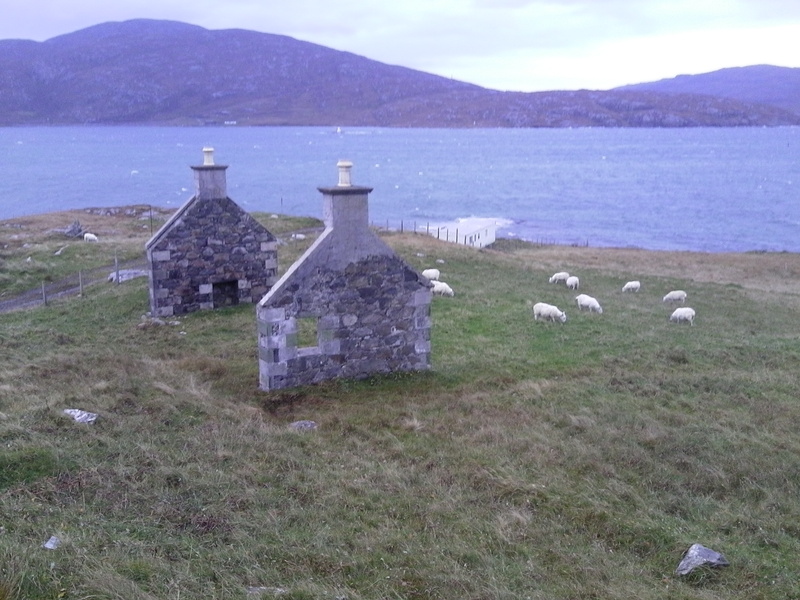 We only had the one day on Barra, so we had to make the most of it, despite Ophelia, but hey, what’s a little wind and rain??? The answer could have been a little bemusing if I hadn’t done some research before the trip: “Go to the airport”. 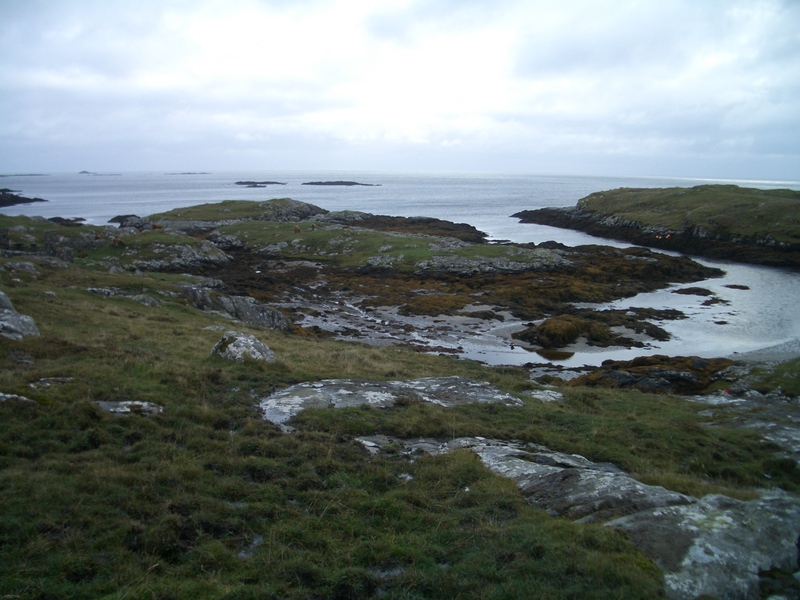 Now Barra is a small island. There is only one road, which runs right round the island in a loop. This road is 13 miles long. Yep, that’s all. 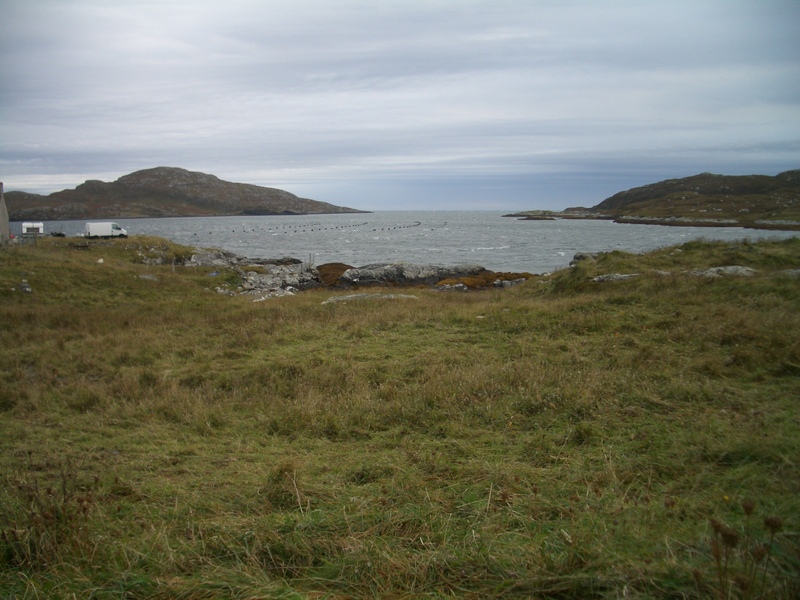 There are a few dead end roads leading off it, going to the odd house or beach, pretty much all of which we explored, because, hey, it doesn’t take too long to circumnavigate the island. 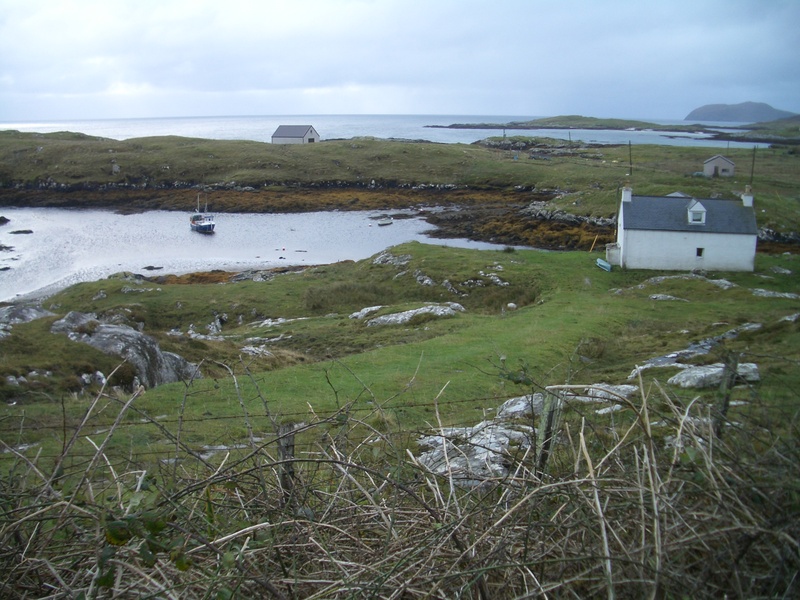 I was amused as we returned from one of the dead ends, turning out onto the ‘main’ road, to be faced with sign posts – to the left, Castlebay 5 miles. 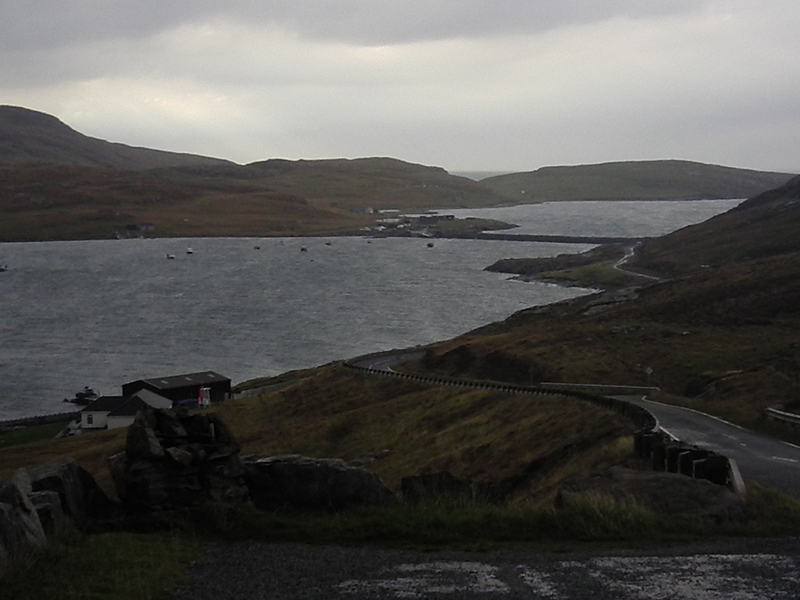 To the right, Castlebay 8 miles. 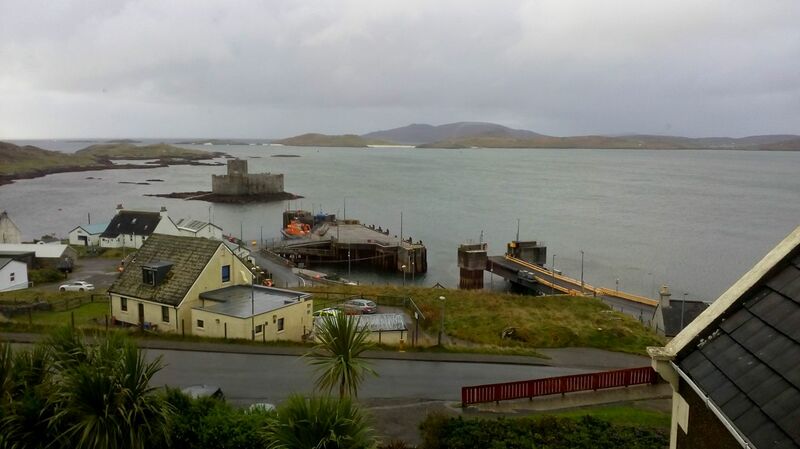 Castlebay is the only town. 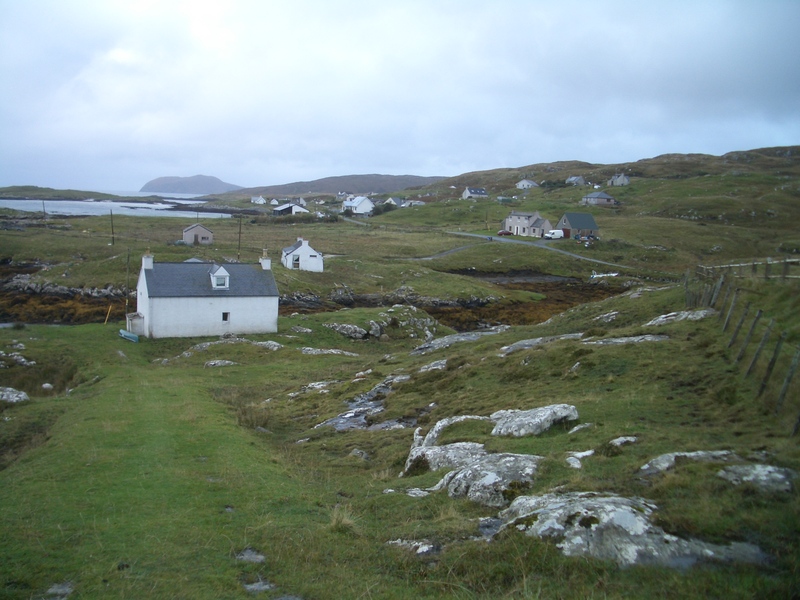 Really, the only settlement of more than about a dozen houses, and Barra combined with its adjacent island, Vatersay (joined by a causeway) has a population of about 1300. So back to that airport. Think I’m kidding? Er, no. 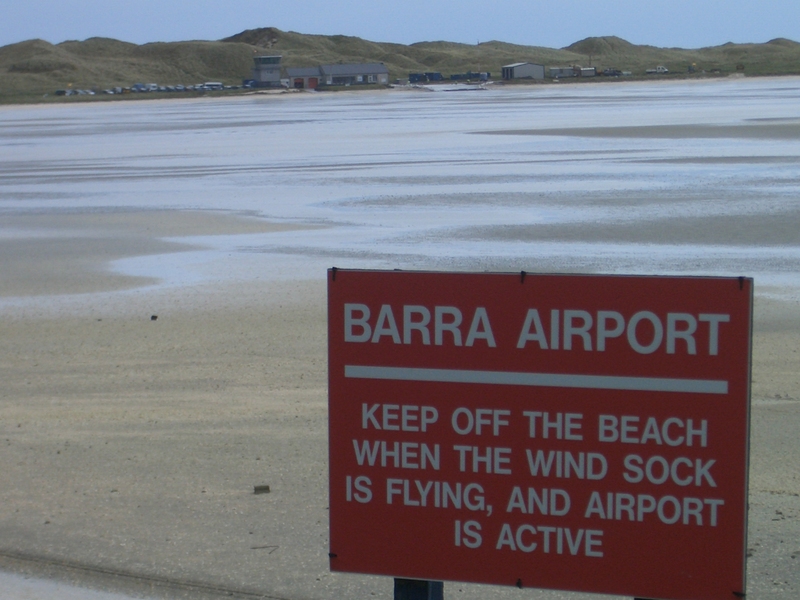 Barra airport is the ONLY commercial airport in the world where planes land and take off on the beach between tides. 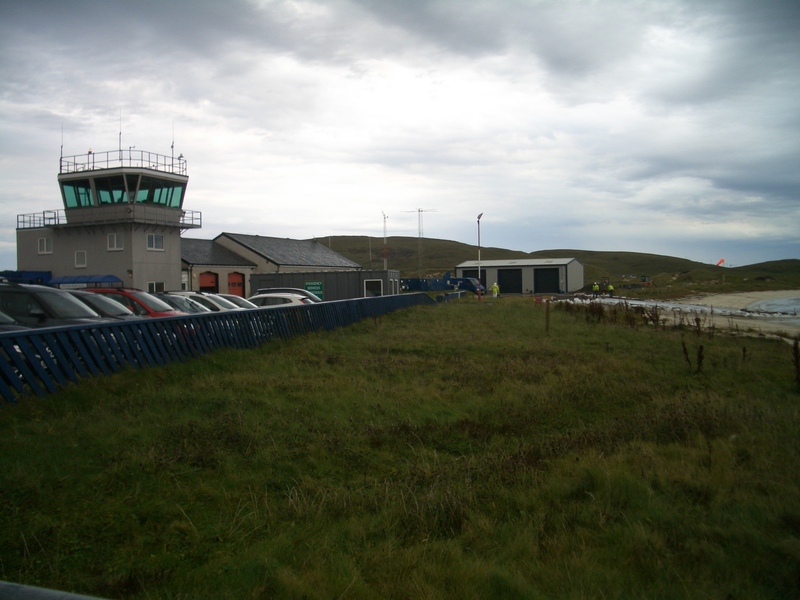 THIS is why people go visit Barra airport. Driving out towards the airport, we noticed people out on the HUGE sand beach, digging, and realised they were commercial bait diggers. Yes, that’s a car out there with them. 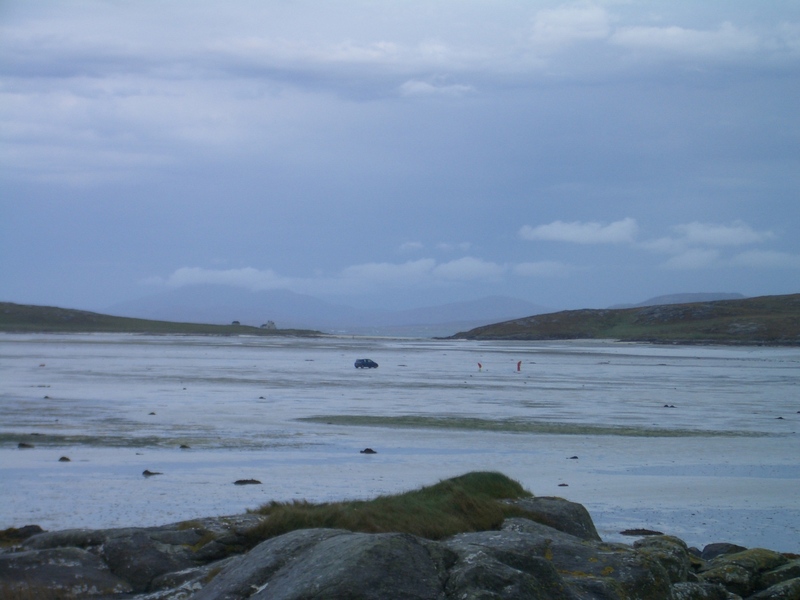 One of the enduring memories of the Outer Hebrides, will be the amazing golden sand beaches, so beautiful that one of them has been used by the Thailand tourist board in one of their adverts! 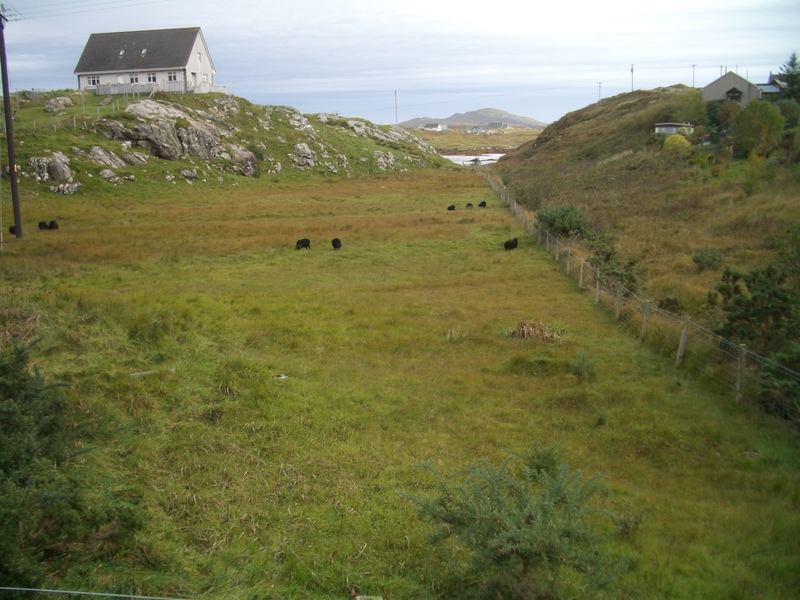 I believe I’m right that it’s on one of the uninhabited islands, but I might be wrong. 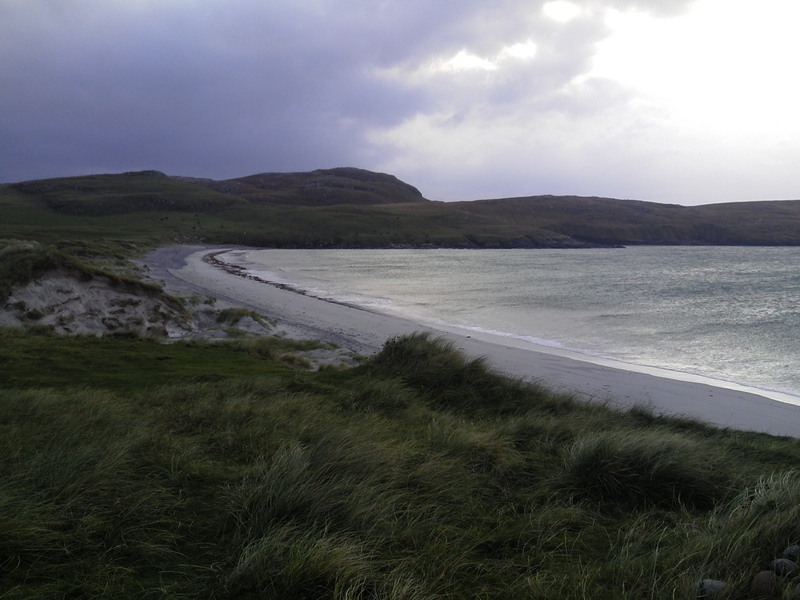 Anyway, the Western Isles have the most beautiful coastline. So. Ophelia or no Ophelia, I was determined to see a plane land on this beach. I’d already looked up the timetable, and there were 2 flights due in. With the hurricane, and the fact that all ferries were cancelled for the day, I wasn’t sure this was going to happen, but to the airport we went in hope. After all, there really wasn’t much else to do, now was there? 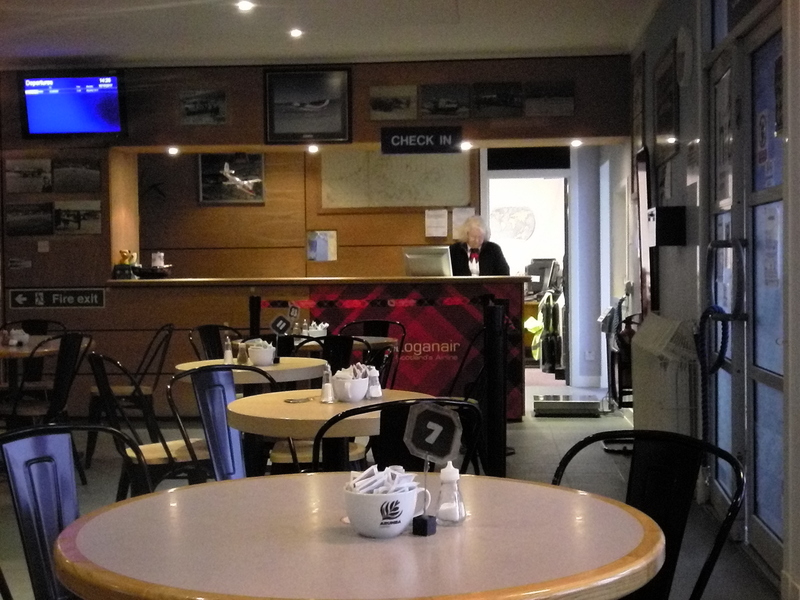 The airport turned out to have a fabulous café (the only one open on the island, now tourist season was done), so coffee was drunk while we waited for the delayed first flight. The staff were becoming agitated, because there was now a possibility of two planes arriving at the same time – not something they were used to handling! Fortunately for them, the first was cancelled. I was now pinning my hopes on the second, and final, flight of the day. Ophelia decided to hose down at this point, and I was disappointed that after all that waiting, I missed filming the landing because I was sheltering inside the car, and the little plane came so fast over the hill behind us it was on the ground before we’d realised it. But here it was, and I’d witnessed it even if I hadn’t filmed it. Not only does it handle the baggage, but when the plane lands and takes off, it rushes out across the beach and parks way out there, to mark the end of the runway!!! and I was a bit concerned to notice that, while they were in the process while we were there, of laying concrete for what appeared to be a hard-standing area out front, just a present, there is absolutely nowhere to park a plane off the beach if it doesn’t take off again in time. At least that meant we would see it take off. Now you can see how small this aircraft is. We watched 17 passengers get on it! So with crew, that was 19 or possibly 20 people and luggage – where did they pack them all??? After getting in position, that little plane stayed on the sand for an uncomfortable length of time, considering the tide was now rushing in. The red van was parked out at the end of the ‘runway’, and I have no idea what the hold up might have been, but I do know Ophelia was revving up, because I got SOAKED! Finally, and please bear in mind I was struggling to stay upright by this point, it took off. Typically, the rain then eased, and the rest of the day wasn’t too bad. I did eventually dry out – another cup of coffee and lunch in the café before it shut down helped, while we watched the ‘runway’ vanish beneath the waves. Can you see those black dots in the water? 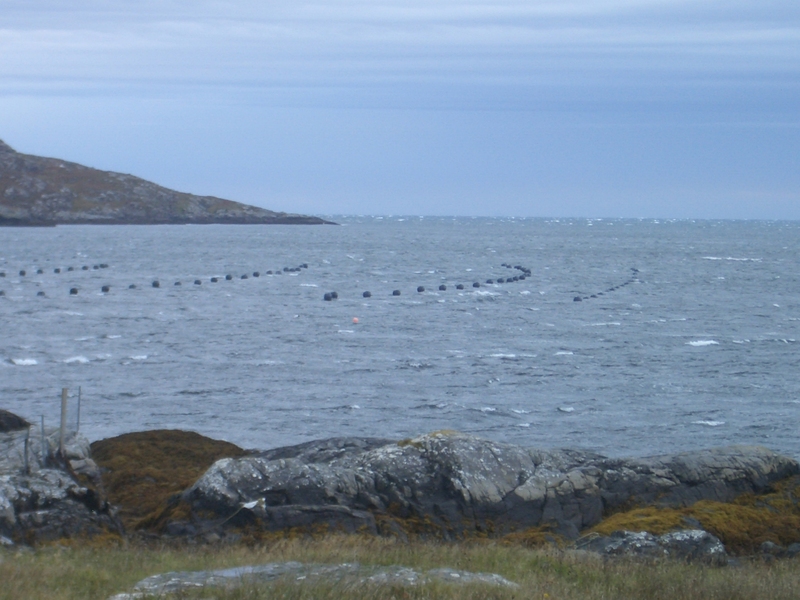 It’s a mussel farm! Apart from tourism, about the only industry on the islands is sea food. 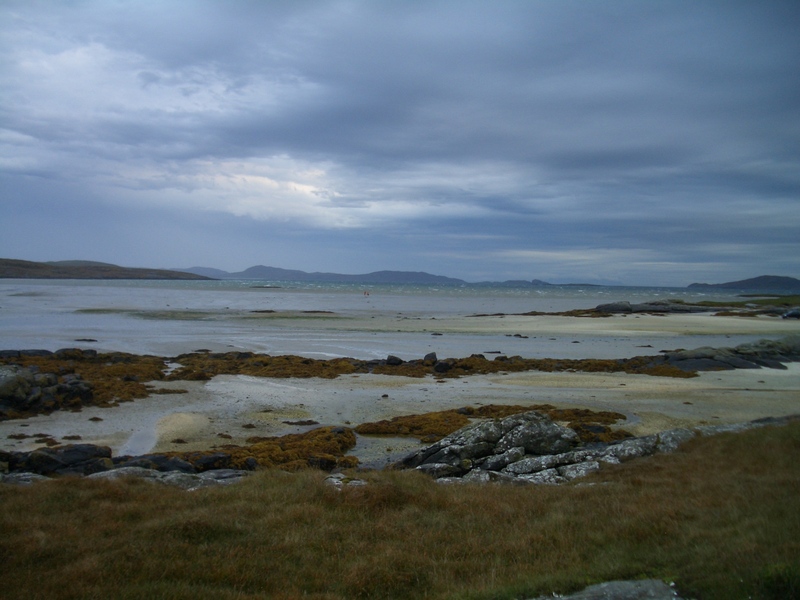 And when you watch this next one, the near coastline is Barra, the one opposite is the adjoining island, Vatersay, and the causeway joining the two – the only reason that Vatersay remains inhabited. Lol, I’m not one to let a little bad weather ruin my holiday – I’m British!!! The airport–amazing. I’m glad you took a movie because I wouldn’t have believed it otherwise. I’m still wondering what they would do if the aircraft had a technical hitch and couldn’t take off in that short turnaround time. There really is nowhere to get it off the sand! Thank you for sharing this lovely vacation. 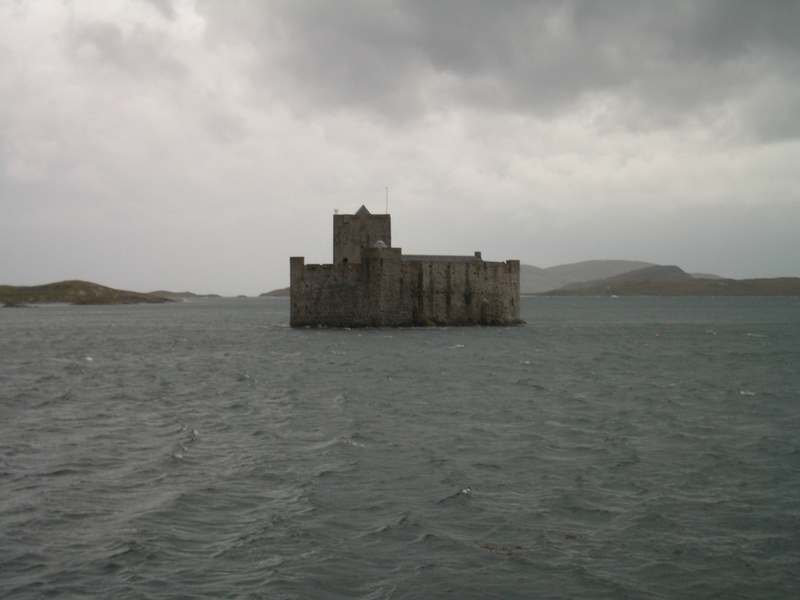 There is an extraordinary mixture of historic and modern on these islands, I also found the hundreds of ruins sad, but that’s the way it goes on these remote islands, some of which are no longer inhabited at all, because the young want lives with all the modern trappings, and it just doesn’t happen out here. Next instalment coming out on Monday.